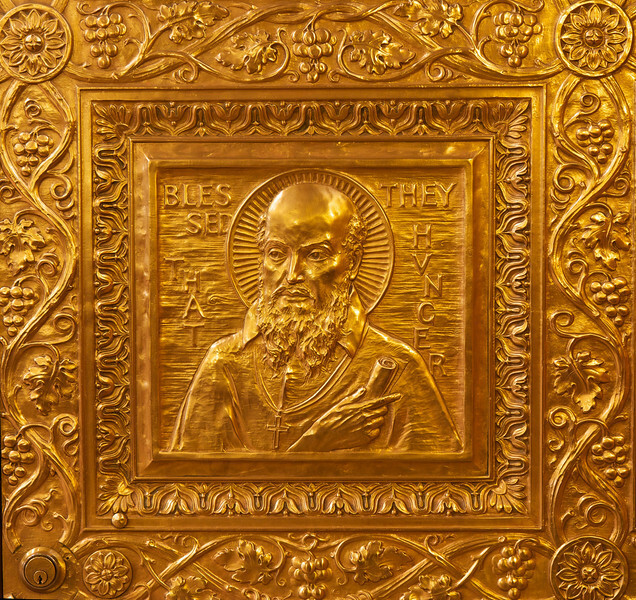 The church has two sets of great twelve-panel bronze doors located at the sanctuary end of the side aisles. They were gifts of the Simpson Family in 1929 and mark the close of a generation of generous pre-Depression gifts. Rev. Patrick O’Gorman designed the doors. The north doors north-side doors depict the saints who personify one of each of the eight Beatitudes. I don’t know anything about this panel, but it says “Blessed that the Hunger.” The doors were crafted by the Long Island Bronze Company.